They are worth a comparizon with the Terminator T800. 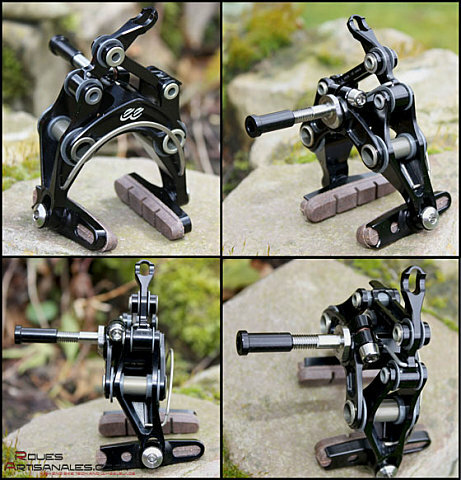 EE Cycle Works brake calipers look very agressive. Cleverly thought, the EE brake design was optimized with extensive use of finite element analysis. This method helps to find « the » best solution, the best compromise. force applied on the brake levers. The pivots are moving through self-lubricating plastic micro disks, for a smooth functionning. « You will only use one finger, where you were used to brake with 2 fingers with standard brake calipers » claims Craig. The braking power is claimed to be higher than standard calipers such as Sram red, Dura-Ace or Record. Against single pivot super light brakes, we should be in a different dimension. We tried them during a few kilometers, and indeed we found the braking power to be well present. It is not proportionnal to the force applied on the brake lever, but exponential! Every single pivot is oversized, just as each part of the system, and we have to mention that despite the 5 pivot, there is no play anywhere. We are clearly far from the normal design by Campagnolo, Shimano and Sram, generally 50% heavier, which have not been deeply modified since years. These brakes are under test on our machine, and have replaced the Kurve we presented late in December. We have to realize the braking is far better, much safer than with the Kurve. You will know more in the brake test we are preparing. 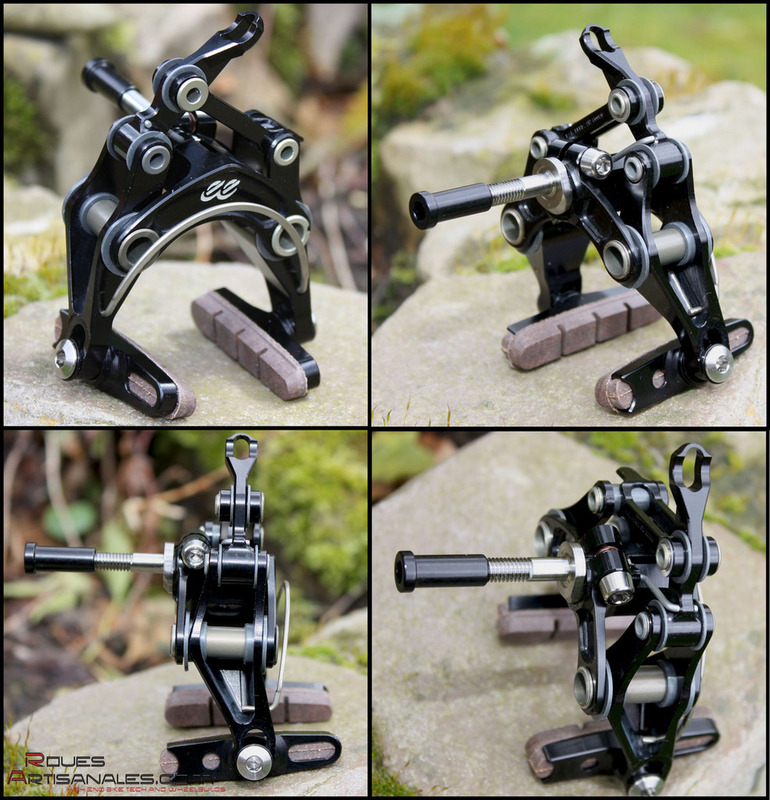 The whole system doesn’t only feature a strong and light design, Craig wanted the brake to be fully adjustable. Thus, the main axle mounting bolt is eccentered so the caliper can be set in height and in lateral position. The pads holders has a spheric nut to allow a perfect setting. The brake pads can be changed within 10s, with no tool, thanks to their half slot and the shimano style pads. This is really new and it has to be mentionned. 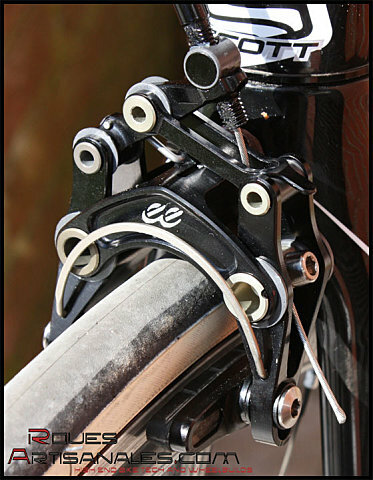 Beside this, the brake is designed to make the cable housings right in front of the frame, or right behind it. There should have a micro aerodynamic gain too. Finally, in case of wheel change during a race, one of the lever can be used as a quick release and thus the wheel falls very easily. In short, the EE brakes are very well thought. High braking power, easy to use, lightness, they have every advantages. However, their look and their price may be their only cons. The set of calipers cost 519 dollars.